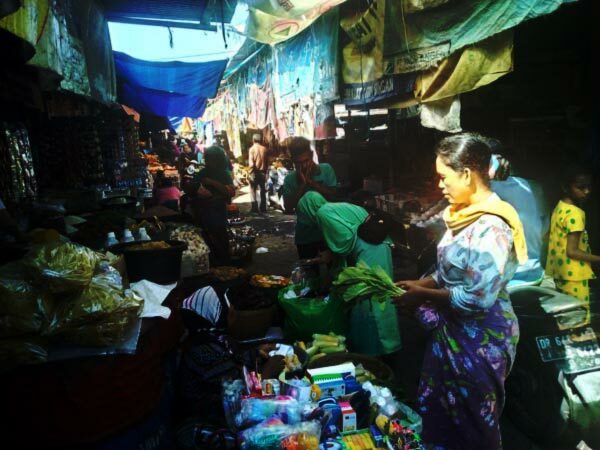 As you might already know, Lombok is not only famous for the beaches and temples: it’s also home to quite a few markets and other shopping places that attract thousands of tourists every year. The Sweta Market is, of course, one of the most popular ones, and folks that visit it have only nice things to say about their experience there. The bottom line is – if you’re a fan of unique, one-of-a-kind stuff (like hand-crafted items), this place is a must-see. So, before you even land in Lombok, make sure to mark the exact location of this market on the map and free up an entire day for this tiny adventure. It truly is pretty awesome, and now you’ll learn why. The Sweta Market is located in Mataram, the biggest city on the island. The exact location is east of Bertais, which is some sort of a “hub” for the local buses. I gotta mention that this is the biggest market in Lombok and, despite the modern-day “vibes”, it’s still a very traditional place. It’s safe to say that once you end up in this part of the town, you’ll instantly feel like you’re right at the heart of the island. People at the market are nice and friendly. However, be aware that there are some greedy and simply bad people that will try to trick you into buying something you don’t really need and/or rob you of your bucks. But they are rather an exception to the rule. Ok, now let’s see what the potential tourists can buy in this market. Pottery products are very popular among the visitors. They are pretty cheap, last for many years, and serve as great gifts to friends/family members back home. The locals are well-respected masters of pottery and carve out all kinds of incredible images on the wares. As I said in the beginning, this spot is all about unique things that will light up your room and introduce an exotic element. Important note: if you bought a bunch of stuff and aren’t really sure you’ll be able to deliver it to your place, these people can help you out with that. The prices for delivery are more than reasonable. The Sweta Market is always full of people – tourists, mostly – and during the “hot” season, the locals make quite a lot of money. Souvenirs like the ones you’ll see here will cost more in Europe and/or America. The affordable pricing is probably the biggest selling point of this market. The fans of clothes will be pleased to learn that both Songket and Ikat are also available. Make sure to check out my reviews of the weaving villages in Lombok to learn more about this craft and what it takes to master it. People put their hearts and souls into this stuff and rely heavily on the tourist flow. The government, in turn, does its best to make sure the visitors have a nice time on the island. Remember I mentioned the fraudsters that want to fool the foreigners? If you’ve got some bargaining skills, use them to drop the price. Most of the time, a 30/40% off deal can be reached without any hassle. Furthermore, as there are always tons of potential buyers in this place, the local pickpockets steal a huge number of wallets. So, don’t ever keep your money in the back pocket of your jeans. My advice: hide your wallet in the inner pocket of your jacket. That way, no pocket thief out there will be able to steal your hard-earned cash. Be smart and don’t let them ruin your time at the Sweta Market. Again, this is a large territory, and it’s not only good for selling something to the visitors. Take a good look around: there are many cafes/restaurants in the area where you can relax and have something delicious to eat. Be careful, though, because the food there is usually very spicy. Lombok is full of exciting spots that make a trip there worth the while. I’m sure you’ll find more than one souvenir that will “click” with your heart at the Sweta Market. After all, the locals know their clientele very well and have been perfecting their art for years, if not decades. Now, along with hand-crafted items – souvenirs and tableware – the Sweta Market is also where you can find the finest spices, herbs, vegetables, and fruit. Some people prefer to visit various villages to buy the goods for cheap, but that’s not really worth it, because the prices are already more than affordable. I’m not sure whether you’ll be able to take the veggies and fruits with you on the plane or not, but the herbs and spices will definitely survive the flight. Both the Sasak and the Hindu people bring their best stuff to this market, not to mention the Arabs and the Chinese folks that mostly live in Ampenan. Yep, this is a place where different cultures come together. Fact: in Bali, all these herbs and spices cost a lot more than in Lombok. And there are a couple of entrepreneurs that travel from there to this island, buy almost half of the available products, and sail them back to Bali. I personally know some folks that brought a significant amount of spices to the States and sold them to their neighbors. Exotic birds are also available at the Sweta Market. They’ve got some rare species on sale. Looking for some jewelry for your girlfriend? You’ll find it here! And because this place is so close to the bus terminal, business is always good and the flow of potential buyers is almost never-ending. As mentioned in the beginning, this huge market can be found in the city of Mataram. So, if you’re already there, just ask the locals for guidance. And if you just landed at the Lombok Airport, then it would be best to hire a taxi that will take you there in a jiffy. The shortest route is 31 kilometers long and will take approximately 45 minutes. However, traffic is not perfect in Lombok and the driver might have to slow down every now and then and make frequent stops. The other two available routes will take 55 minutes/1 hour, which is still Ok. Renting is also an option: this service is very popular on the island; you won’t have any problems renting a car or motorbike. If you’re in the mood to drive, then by all means, hop on a fancy bike and let the wind blow in your face. Usually, it costs 5 to 10 dollars to rent a vehicle for a day in Lombok. What about public transportation? Well, the Airport – Mataram route is probably the most popular one, and that is exactly why the buses leave for the big city very often. Still, the schedule doesn’t always make sense, and you won’t feel comfortable cramped up in one of those “steel monsters”. Thankfully, taxi drivers and rental cars/bikes aren’t that expensive. If you’re in Bali, then a speedboat is the best choice. It will take you to one of the Lombok beaches; from there, you’ll still need a taxi. This is the most colorful market I've ever been to. You can find almost anything there, including the stuff that you mentioned in the article. We bought a whole bunch of souvenirs for folks back home and they were all thrilled! The prices are more than affordable, that's true. Mataram is quite a unique city. It's got both modern-day vibes and some "ancient" parts that make it very attractive for the tourists. This market is a huge part of that. Wow, that's a goldmine right there! I'll make sure I visit this market the next time I'm in Lombok.